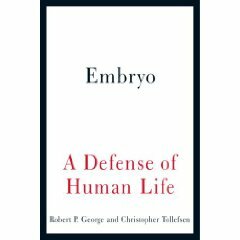 Quite a few people have asked if we could use the book EMBRYO: A Defense of Human Life, by Robert P. George and Christopher Tollefsen, for our Pro-Life Academy. Beginning March 16, we’ll discuss a chapter per week from this extraordinary book. Written in plain language, it gives an excellent biological description of development, as well as the philosophical and ethical arguments in favor of the embryo’s personhood. Check it out at Amazon. Order soon! Since I am probably not going to buy the book, I will look forward to your exposition on it. I will probably not accept everything the author has to say, but knowing what he says is prerequisite to knowing whether, how, and why I disagree. See if they have the book at your public library. So it does, Mary Catherine. Thanks for the tip. I’ve always been one to read ahead of the class.